Are you as excited about pumpkin carving and seeing all those adorable little trick-or-treaters as I am? What would Halloween be like without a carved pumpkin grinning from the front porch or peering out the window? With playful eyes and uniquely shaped gourds turn this year’s pumpkins into easy-to-make silly monsters that any kid will love. 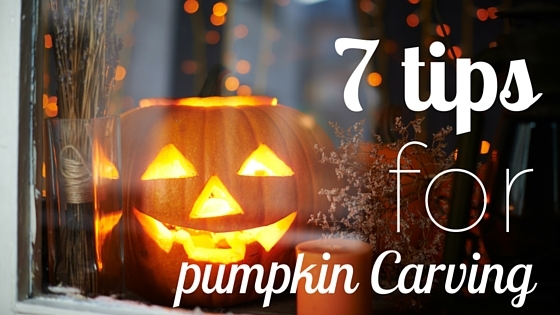 Today we are going to look at 7 tips at pumpkin carving that will get you and your little ones started this Halloween season. Pick the right pumpkin. You are looking for a pumpkin that is fresh, has a sturdy stem and no bruises, and that has a flat bottom so it won’t roll. Cut out the lid on an angle, not straight up and down or the lid will drop inside the pumpkin when you put it back on. Scoop out all the pulp- and then some more. Most grocery stores have a special “Halloween Carving kit ” that has a “claw” for doing this. But, you can use a large spoon or an ice cream scoop to do the trick. Thin the wall of the “face” area to 1 1/4 inch thick so it will be easier to carve. *make sure you save the seeds so you can roast them later! Get comfortable, some like to hold their pumpkin in your lap when you carve the features, I feel more comfortable with the pumpkin firmly on the table or even better down on the floor! Make sure you don’t cut on a slant with clean up-and-down slices look the best and always cut away from your body. Keep your pumpkin fresh by spreading petroleum jelly on the cut edges to seal in moisture. If your pumpkin starts to shrivel I have heard you can soak it in cold water to plump it up. I have not tested that so do this at your own risk! Create a small chimney for the smoke and never leave a candle un-attended especially around curious kids and animals. What’s your trick for the perfect Pumpkin carving? So now you have your pumpkin is clean and ready to carve…will you go spooky or silly? Traditional or something a little more detailed? Instead of doing a round up I thought it would be fun to share what I have been pinning on pinterest. From toddlers to teens, you and your children will love making these fun pumpkin carving ideas for kids this Halloween Season. Follow carving stencils & non carving ideas on Pinterest. « Spooktacluar DIY Halloween Costume Ideas you’re going to love! I love to pick funky shaped pumpkins, too – and carve them creatively. This year, mine had an odd stem and the flat part was actually on the side. Instead of carving it from the stem side, I used the stem as a witches nose, carved a face around the stem, and put a witches hat on top. I also use LED candles so I don’t have to worry about watching it. We didn’t carve pumpkins this year! But these are great tips. Here’s to making time for it next year! With all our travelling, we had ZERO time for carving this year! Bookmarking this for next year! I haven’t carved a pumpkin since I was little. I keep saying I want to carve one then I change my mind when I see the work.